MACD indicator, or Moving Average Convergence Divergence, is one of the key indicators for identifying and following trends in the financial markets. Aside from that, many traders use stochastic indicators as well. But how does a trader deal with things like stochastic model, MACD divergence or MACD histogram? Let us see what these things are all about and more importantly – how they can be used to trade more successfully than the other guy. For starters, the MACD indicator is based on a relationship between two moving averages of prices – an average closing price of an instrument over a period of time that keeps moving one day at a time, hence the name ‘moving average’. If you factor in the importance of recent data and assign them more weight, you get an exponential moving average, or EMA. These moving averages are calculated for different periods, usually 12 and 26 days, and if you subtract the 26-day from the 12-day EMA, you get your MACD indicator. The importance of MACD indicators is that they are relatively objective and easy to calculate, and enough people use them to create an aura of reliability that surpasses many other instruments, including the stochastic indicator. Every time the price stands out from MACD indicators serves as an indicator of an instrument being overbought or oversold. This type of MACD divergence between an arbitrary indicator and a real-life situation is usually rectified as thousands upon thousands of traders reach the same conclusion and pull almost identical moves simultaneously and MACD indicators ‘save the day yet again. All you can do is watch as the difference between the MACD line and the signal line in the MACD histogram melts away. On the other hand, MACD indicator is not the only one trying to find a link between closing prices and future price action. Stochastic indicators work under the assumption that the closing price of an asset is linked to highest and lowest prices in the 5-day period (for the K line and 3-day period for the D line, see the second picture). Stochastic models can be used to estimate probability of an outcome when one or more variables are unknown. Statistically speaking, any outcome comes with a certain probability and this type of analysis is great for risk management. As for stochastic analysis in general, it involves drawing two lines on a regular chart for a particular asset: the %K line is the faster one and it deals with highest and lowest prices of an asset in previous five days as well as the most recent closing price. The %D line is slower, but considered more important, as it deals with highest and lowest prices over the last three days. Thankfully, traders no longer need to calculate these lines manually, as there is software that does this for them automatically. All they need is a good platform and some know-how. 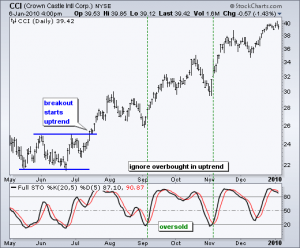 In any case, investors need to watch out for these two lines, as they indicate if an asset is overbought or oversold. 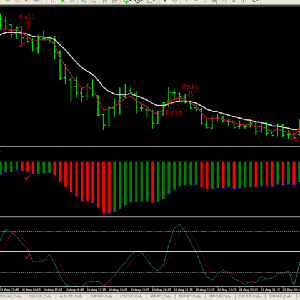 In combination with the MACD indicator, this can be a powerful mix.